The trees around your home provide more than just shade; for instance, they often add tremendous value to potential buyers. Trees can go wrong, however, and it is important that you recognize when it is time to make the decision to remove a tree from your property. Trees get sick and, yes, they even die. Often, however, trees take a very, very long time to show obvious symptoms of death. If you have a tree that is dead, dying, or infected with a potentially spreadable disease or insect infestation, then it is likely in your best interest to have the tree removed immediately. As mentioned, it may not be obvious that your tree is dead or dying, but if you begin to notice excessive branches falling, a wilted color, or lackluster appearance, then you should call our Shelby Township tree service immediately for a professional opinion. Once your tree has been looked at by our expert team, you’ll know whether the tree is unhealthy, dead, dying, or able to continue on as normal; often, trees are still healthy enough to stand for many years to come, but we’ll never know for sure until we take a look! No tree should touch your home; in fact, most home inspectors and insurance adjusters will blatantly tell you to remove a tree if it is even within a certain distance of your home. Trees pose a tremendous risk to your roof, windows, siding, and even family members by being in close proximity with your home. While damage can come from above, it can also come from below; tree roots are known to break up foundations, sidewalks, driveways, sewer lines, and more – likely costing you thousands. 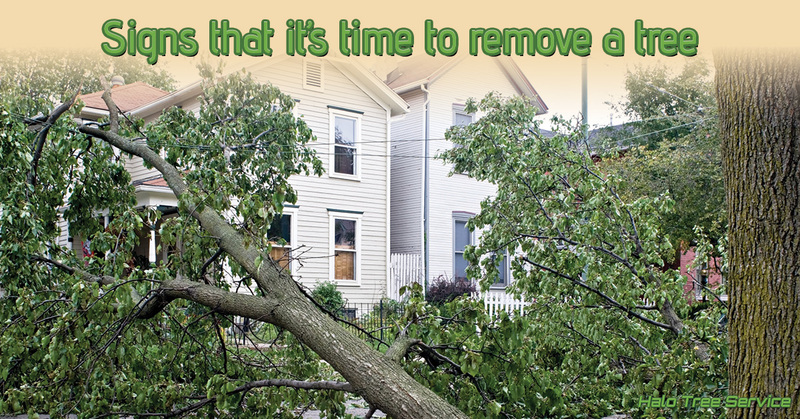 If a tree is, or could start, causing you problems, then it may be time to remove it, lest the problem get worse. Whether your tree was once healthy or has been damaged in a Michigan storm, a tree that is even slightly leaning can pose a tremendous health and safety risk. While sometimes this issue can be remedied by trimming, pruning, and creative tree services, often they simply must be removed. Larger trees, especially, pose a tremendous danger to your family, home, and neighbors if it were to suddenly collapse or relinquish a large branch. Worse still, your homeowners insurance may dispute any claims made for a hazardous tree, as it is your responsibility as the property owner to remove leaning trees. When in doubt, contact our tree service for an expert opinion on your tree’s risk factor and the best course of action for dealing with the issue. There are plenty of other reasons that a large tree in your yard can pose a problem. Perhaps, for instance, the tree leaves behind a mountain of leaves every fall, or prevents sunlight from reaching your lawn or garden, both of these instances can justify a tree removal. Other tree problems could be linked to allergies, personal preference, power line hazards, building development hindrance, damages to a neighbor’s property, and dozens more. In any case, if a tree is causing you problems, those are unlikely to be remedied by simply trimming or pruning it back; in these cases, tree removal is often recommended. If you need tree services of any sort in the Shelby Township area, contact the dedicated team of experts at Halo Tree Serve. Our team can help you with the best, most desirable course of action for each tree on your property, including tree trimming, pruning, stump grinding, and, of course, whole tree removal. Our goal is for each tree on your property to be an asset – never a liability. Learn more and schedule your appointment with our tree service team today!